In one of Disney’s most brilliant marketing moves since acquiring Marvel Entertainment earlier this year, the House of Mouse has teamed up with the House of Ideas to give our favorite Marvel characters the Tron treatment in anticipation of Walt Disney Pictures’ Tron: Legacy, which hits theaters on Dec. 17. Hooray for corporate synergy! 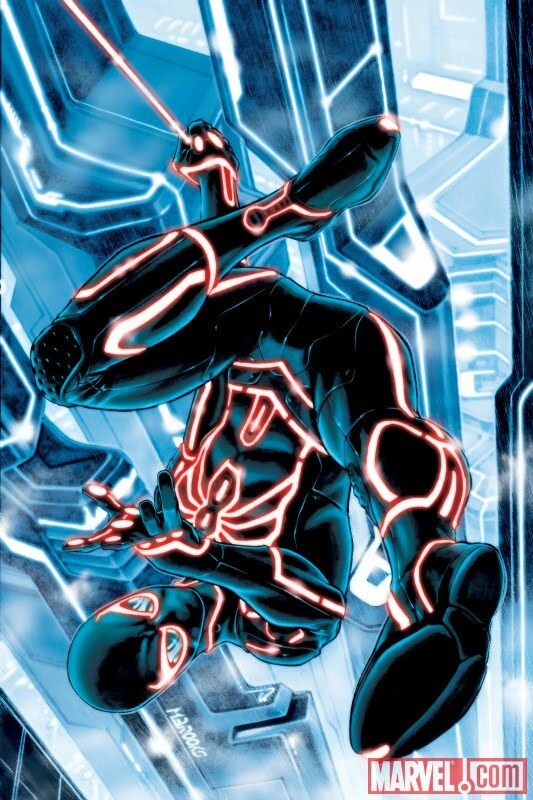 Beginning in November, Spider-Man, Iron Man, Thor, Ms. Marvel, Captain America, Wolverine and others will be reinterpreted as denizens of the computerized Tron universe on variant covers of the publisher’s top titles. My personal favorite? Mark Brooks’ Tron reimagining of our favorite wall-crawler on the variant cover of Amazing Spider-Man #651. The issue hits shelves on Dec. 15. To check out all of the Tron covers, visit Marvel.com.